Whether we like it or not, we are living in a data driven world. It impacts every citizen and is reshaping modern healthcare for patients, clinicians, researchers and insurers. It seems like new companies emerge every day that are either making devices that collect data, actively collecting data, selling data or selling services based on data. While humans create a lot of data, machines are starting to generate even more. The world of the Internet of Things (IoT) is now generating data faster than humans. That is because there are 26 times more internet connected devices than there are people. At first this may be unbelievable, but think about it, your TV, computer, cell phone, work badge, credit cards are all connected. And now with ‘wearables’ too, each of us alone has five to ten devices, at a minimum, connected to the internet. The IoT is doing two things. It’s creating better healthcare solutions for individuals wearing these devices and they are creating a TON of data. First, let’s look at personalized or precision medicine. Let’s assume you’re 35 or 40 years old. You grew up going to the doctor every two to three years. You were supposed to go once a year but given how busy you were, you missed a few. The doctor would take your height, weight, temperature and blood pressure. Then the doctor would ask you a series of questions to see how you were doing over the last couple years. You would answer honestly, but through no fault of your own, you may have forgotten that week you weren’t feeling well or had a bunch of headaches and didn’t work for a week. Today, you feel okay but decide you have some aches and pains or can’t sleep so well, and the doctor gives you a prescription. Fast forward to 2017 and you have had a wearable on for the last two years. Now you and the doctor have access to the information they ask you every two years for every day and even every hour for the last two years. The doctor can see anomalies that may happen during the day, the week or the month, and provide a more precise diagnosis of what may ail you. This cuts out a lot of trial and error, saves time, money and could even save a life. Let’s take it a step further. Let’s now look at it from the clinician’s perspective. All this data gets connected (anonymously of course) through a series of connected databases that provides age, location, body type, blood type, and a host of other medically important data. Let’s analyze this data and apply it to your patients to provide better healthcare. This is precision medicine. Now that data is stored in electronic healthcare records and it makes the diagnosis of ailments much faster and more accurate. Precision medicine is about moving from generic to more precise, population-focused diagnostics and treatments by factoring in data from patients’ genes, environment, lifestyle factors and family history. This data then informs clinical decision-making for earlier, more accurate diagnoses, and more effective treatments and approaches to prevention. In this way, data has truly become the DNA of modern healthcare. And it doesn’t start or stop in the doctor’s office, it applies more broadly to research and life sciences in general. In 2003, we sequenced the first human genome. To do that cost a little over $2.5B dollars1. Fast forward to today. The cost to sequence a human genome today is approximately $5000 dollars, removing much of the cost barrier. As a result, genome sequencing is happening at a greater frequency and we are creating petabytes of data. There are conversations going on right now with genomics companies and nation states to sequence the genome of every citizen on the planet, and this will become the first entry in a person’s health care record enabling more effective care. Data also impacts and influences health insurance providers. 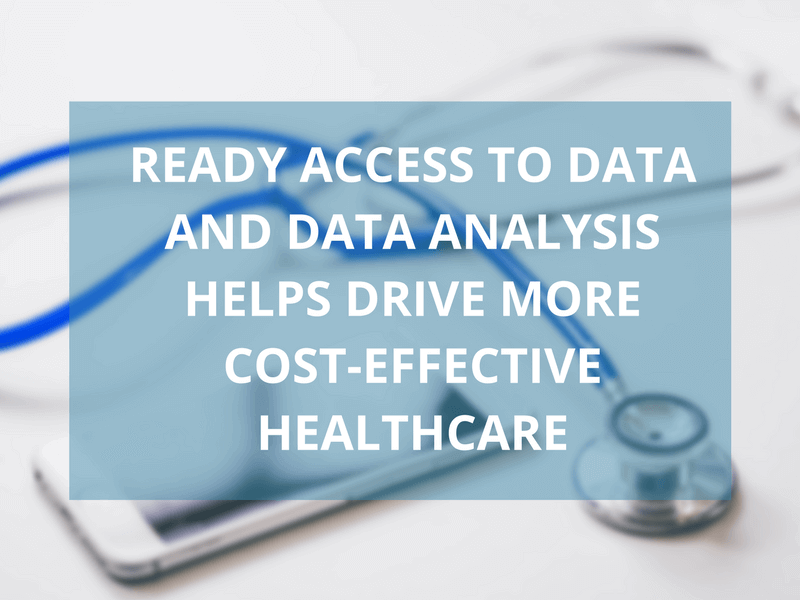 Ready access to data and data analysis drive more cost effective healthcare. Armed with these tools, insurers are better able to determine what rates to pay out for services, whether unnecessary tests are being performed, or to detect fraud. Pharmacies such as CVS and Walgreens are also similarly impacted by data. As we develop more integrated systems for this data and becomes part of your health record, two more things can happen. First, algorithms can crunch the data and see if your prescription, when compared with other people who have been given this same prescription and medical history have been treated successfully or if they have had some bad side effects. Secondly, more connected systems can get you your prescriptions faster, and even notify you when they are ready. Electronic health records are saving people’s lives. It’s no doubt that these connected data inputs and outputs, human and machine, are creating a lot of data. Providing access to this information securely and ensuring it is available to the right parties in a meaningful way when they need it, is called healthcare content management (HCM) and is becoming more and more of a challenge. INFINIDAT is based around all these scenarios and we understand that security, access, availability, scalability and simplicity are all key factors in how healthcare organizations look at data and analyze it to help drive better clinician experiences and patient care. Visit us at HIMSS 2017 in Florida next week and learn how your healthcare peers are working with INFINIDAT to store humanities data and make new types of healthcare computing possible.